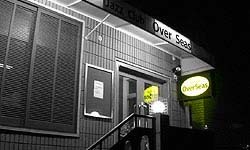 Welcome to "Jazz Club OverSeas"
Jazz Club OverSeas is the place to visit. The musical feasts created by Japan's renowned pianist Hisayuki Terai are worthy of a special journey to Osaka. We invite you to enjoy world-class drinks and cuisine while relaxing at Japan's peerless jazz club. as the protege of jazz legend Tommy Flanagan. Like Flanagan, Terai is famous for both his poetic touch and solid bebop style with witty interpretations. Terai is one of the few continuing the Detroit hard bop piano style of his mentor. Depending on the evening and performance, our standard cover charge ranges from 1,500 yen to 2,500 yen per person for three music sets, with students given a 50% discount off of this cover charge. Note: For our special guest performances, discounts are not available and the cover charge will usually apply for each set. 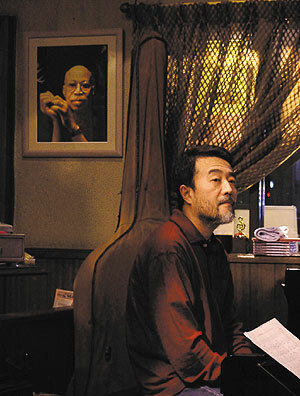 Download Hisayuki Terai's album "Evergreen"　from CD baby.com! Exquisite jazz standard album, jazz legend Tommy Flanagan's protege adding new sparkles to ageless songs. English and Japanese spoken here! Two minutes from Sakaisuji-Hommachi Station, Exit 12. Sakaisuji-Hommachi Station is at the intersection of the Sakaisuji and Chuo subway lines, making it readily accessible from anywhere in Osaka. About 15-30 minutes from Shin Osaka Station or from OCAT at Namba Station. Take "Exit 12" and turn right at the narrow alley at rear of Seven-Eleven convenience store. 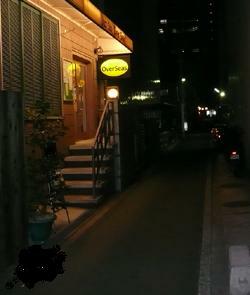 You will see our yellow Overseas sign about 15 meters down this street.